Ali Akbar Salehi, Vice-President of Iran and the head of Iran's atomic energy organisation has warned the U.S. for supporting Saudi Arabia saying, it will upset the regional balance of power. He further stressed that West must change the course "If the Iran deal is to survive". Referring to the Saudi purchase of $100 billion of U.S. arms during Donald Trump's recent visit to Riyadh, Ali Akbar Salehi wrote in Guardian, "Lavish arms purchases" by regional actors because of the abundance of oil wealth would be seen as provocative in Tehran and that it would be unrealistic to expect Iran to remain "indifferent". The article by one of the architects of the 2015 landmark nuclear deal comes at a time when tensions in the Middle East are at an all time high as Tehran and Riyadh are having conflicting views on the regional wars in Syria and Yemen. Salehi said it was possible to rescue the deal's engagement if it was met with reciprocal gestures. "The fate of this hard-won deal depends, in the final analysis, on western resolve and adherence to the principles just mentioned. Disregard for Iran's genuine security concerns, either through deliberate changing of the military-security balance in the region, or by stoking Iranophobia in the region and beyond, would jeopardize engagement," wrote Salehi, the vice-president of Government of Iran. "Often following hard-won engagement, some western nations, whether distracted by short-sighted political motivations or the lucrative inducements of regional actors, walk away and allow the whole situation to return to the status quo ante," wrote Salehi. Salehi warned of "chaotic behaviour" and "further tension and conflict" if the other side disregarded Iran's security concerns, failed to adhere to its commitments and insisted on what he called alternative facts that are bound to create unnecessary crisis including ideas such as the "clash of civilizations", "Sunni-Shia conflict", "Persian-Arab enmity" and the "Arab-Israeli axis against Iran" Salehi wrote in the Guardian. Trump's first foreign trip to Riyadh has led to the diplomatic isolation of Qatar by Saudi Arabia and its allies which has tilted the regional balance. Salehi cautioned, "We would all end up back at square one." "Unfortunately, as things stand at the moment in the region, reaching a new state of equilibrium might simply be beyond reach for the foreseeable future." warned Salehi. 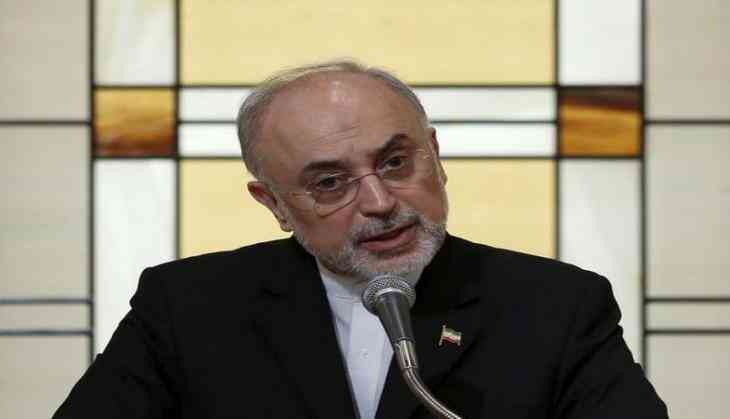 Salehi urged the outside world to take heed of the results of last month's Iranian presidential election and the message Iranians sent, but he said "engagement is simply not a one-way street and we cannot go it alone". Although Trump has promised to "dismantle the disastrous deal with Iran", he has not so far taken any concrete steps to scrap it. Last month, two days before Iran's presidential election, his administration announced that it was continuing to waive nuclear-related sanctions under the agreement despite Washington toughening up its overall Iran policy.